I’ve been saying for quite a while now that there is nothing like the death of your parents to bring home the idea of your own mortality. But now I have to rephrase that to “there is nothing like your own mortality to bring home your own mortality”, or I should say “nothing like getting a somewhat-sorta-maybe-but-probably-not-quite-yet death sentence”. However, let me quickly add for those who might happen to worry, what Mark Twain said, “The rumors of my death have been greatly exaggerated.” And I really do feel quite fine today in a way that I think is actually quite realistic. So, what’s this all about? For those who just want the Cliff Notes, simply glance at this entry’s tags. But for those who’d like to read the story (especially those who may be of advanced age), which may or may not be interesting and telling, please read on. Then I woke up. What the heck? However, it did humanize Martin Luther King and also made him seem like a good and dedicated man, to the extent of self-sacrifice. Why that would be important was that lately I had been reading so many various negative conspiracy theories of every stripe that it seemed to show that evil existed absolutely everywhere behind every historical event, and that virtually every person we think of as a hero was actually an agent of some demonic force or another, working to wreak our destruction. The problem is that we don’t know, really, do we? I mean, if we weren’t there, we only have the word of historians, whose accounts conflict, sometimes diametrically. But what fascinates me is that there WERE people who KNEW, who WERE there, and something like a “universal knowledge field” has that actual information, if only we could tap into it. (It reminds me of when a house I had been renting had been burglarized and the sheriff came to search for fingerprints, he took a look at my dog who was sitting there wagging her tail and he said to her, “Who did this girl, huh?” We both KNEW that SHE knew who the burglar was, but unless we could accomplish a “Vulcan mind lock,” we’d have no way to get the information. But something in the Universe, be it human alive or dead, or animal, or even plant…KNOWS the truth about something! For example, the concept that America didn’t have to enter into World War II, that it was only evil international financiers who wanted it and when they got their political puppet FDR into office, he manipulated events that caused the Japanese to attack Pearl Harbor and then it all began. We could have actually stayed out of the war, because we otherwise weren’t any danger. While this is a cute and proud story in our family’s history, I realized that it also showed that the United States had not been isolated from global events concerning this war. I don’t think we hear much about German submarines in the Atlantic coming so far as to mine an American harbor, but my father’s own history demonstrates, that as far as I was concerned, this was an actual attack on the U.S. on its EAST coast by Germans, so it wasn’t all about Pearl Harbor, and it seems that our entering into the war WAS based on truly being in danger, not due to the manipulation of financiers or a trick by FDR. Now, regarding Martin Luther King whom I had the dream about, a dream about him might have been timely in that we had just recently had Martin Luther King day and the Internet is filled with articles about how King was a Communist and a womanizer who loved prostitutes, some of whom he was violent with, and that King never wrote a word that wasn’t plagiarized. Hum. One of the problems with all this is that even if it were true, as a symbol, Martin Luther King provides hope and self-esteem for a whole race of Americans and it may not be a good idea to destroy that symbol. However, I’m going to talk a little bit more about this later in this piece. Tuesday afternoon, I had an appointment to see my doctor. All I wanted him to do was write a referral for me to have a colonoscopy, a test I never had had and didn’t really WANT to have, but which I finally had been convinced by friends at work that it would be beneficial for me to have. However, my doctor said that he hadn’t seen me for several years, so since I was there, he wanted to do some blood work on me. Okay, some blood work wouldn’t hurt. After the blood work, he said, “I think your blood pressure might be a little bit high, let me take your blood pressure again.” The nurse had taken my blood pressure when I first sat down, I think it was 128 over 90. My doctor said “90 is a little high, it ought to be between 70 and 80.” When he took it again, this time the lower figure was 82. Still slightly above normal, but not too bad. Then he tried to take my pulse, but seemed to be having trouble with it. So then he put his stethoscope against my chest and listened for quite some time. When he finished, he said, “Your heart rate is irregular, you’re going to need an EKG.” So the nurse came back in and gave me an EKG. I laid there calmly, thinking that the EKG wouldn’t really show anything bad, but once it was over, the doctor said that while it was serious and that I needed to be seen by a cardiologist, it wasn’t so serious that it was an emergency. What? Not so serious that it was an emergency? But I felt fine, more or less, or at least I felt more fine before hearing this information than I felt afterward! Anyway, the doctor wrote out a referral slip for the colonoscopy that I had wanted-but-not-really-wanted, and then another one for a cardiologist that I really didn’t want. As for the reason I needed to see a cardiologist, he wrote down “atrial fibrillation,” which I quickly wrote down on a piece of paper for myself so that I could look it up later. The nurse explained to me that the medical group had a new procedure regarding referrals—she was to fax them the referral slips, and then I would receive appointments by mail. Well, that seemed okay. Waiting for the colonoscopy was fine, and as far as the cardiologist goes, maybe this delay would give me some time for this thing to fix itself on its own. I was eager to get back to work so that I could look up on the Internet just what an “atrial fibrillation” was. But as I drove up the freeway, I was thinking of the defibrillator that we have hanging on the wall in our building’s lobby, which both scared me (fibrillation is something dangerous enough that we bought an expensive emergency machine for), and gave me hope (this is something that maybe an electric jolt can fix instantly). However, reading about it on the Internet did not put my mind at ease. An atrial fibrillation is a condition in which the upper two heart chambers do not pump the blood properly—the movement is out of sync with the normal heart rhythm and the blood, instead of being solidly pushed down into the lower chambers, kind of swirls around in mild turbulence in the upper chambers before finding its way down into the lower chambers. The main danger of this is that the blood can pool and then clot in the upper chambers, and then the clots might cause a stroke later. A person with an atrial fibrillation is seven times more likely to suffer a stroke. A second danger is that the arrythmia will precipitate a heart attack. So, while I was not necessarily in any immediate danger, I nevertheless now had a heightened risk of stroke or heart attack. Okay, so how do they fix this thing? This is where I didn’t think any of it sounded too good. Depending upon a variety of factors, the cardiologist may want to find out what the cause of this is (yeah, I am sure all the tests are horrible). However, none of the usual causes seemed to relate to me: recent heart surgery, smoking, alcoholism, a heart valve problem, cancer, or cardiovascular disease. Of course, I may have some sort of cancer, or cardiovascular disease, but somehow I kind of doubt it. The way I look at it, this is one of those conditions that could be caused by any number of things, including in a major way, STRESS, which also means that maybe I have a way I can fix it myself. Of course, none of these intense rhythm-resetting methods (the shocks, and so on) will necessarily mean that the rhythm will stay rhythmic. So it is mostly expected that a person with this condition will be taking two different heart medications (blood thinning and rhythm regulation) for the rest of his life. One must note, however, that all of the choices of heart medications carry side effects and it is a matter of balancing the importance of the heart issue with the importance (or relative unimportance) of various other organs. In other words, the quality of life is going to be diminished in one way or another. Then there is the matter of what happens in case the rhythm cannot be corrected by any of the above-mentioned methods. Then either a pacemaker or a defibrillator is installed into the body under the skin. Of these two options, the defibrillator is the worse, in that what it is doing is administering a periodic shock to the heart, which has been described as being like a kick in the chest periodically. How would you like going through life with that? I’ve not read of any suffering coming from the pacemaker except for the fact that you would have this machine like an iPod nano inside of you clearly outlined underneath your skin (there goes any weak hope of ever regaining your youthful beauty, you’re clearly way over the hill now!) and sometimes in order for the pacemaker to work properly, the section of the heart that naturally tries to control the heart rhythm will have to be destroyed so that it doesn’t interfere with the work of the pacemaker, thus there would never be any more hope of a natural correction. Several years, huh? How many are those? I remember as a kid thinking, “a couple means two, so ‘a few’ must mean three.” I guess “several” must mean four. I have four more years? As I read all this stuff, I realized that the answer to my prayer of the previous night might be this, not the Martin Luther King dream, but I went into the office of my friend Kate to tell her about all this, including the prayer and the Martin Luther King dream, and she wisely pointed out that the dream combined the concepts of, well, “dream”, as in “I have a”, and “heart”, and maybe there was even a message in there about food, or nutrition, or all the things about loneliness, needing comfort, travel, freedom, heroism, discrimination, non-violent revolution, and other huge concepts. I thought that this observation was very wise and it has given me much food for thought. But if I was blessed by Martin Luther King in this dream, I have also been blessed by a minister in an African Methodist Episcopalian church in North Carolina, who changed his whole sermon one Sunday morning when he saw me and my friend Steve (both of us white) sitting in church with Cleo (who was black), who had been my mother’s “nanny” (the word used back then was “nurse”) and whom Mom grew up loving as much she loved her own mother. I had told my mother that on a trip around the country I was taking with Steve (we ended up being gone for three months and traveled 15,000 miles around the U.S.), when we got to Asheville, I wanted to visit Cleo, what did my mother think, should we take her out to dinner? “No,” Mom said, “take her to church. She is too old to get there by herself, now, and that is something she will really love.” Mom’s idea was perfect, and not only did Cleo love it, so did the whole congregation, and the minister in his sermon used our presence as an example of how Martin Luther King’s dream was surely coming true. I want to stop here right now for a moment and point out something in case it wasn’t obvious—think of the relationship between my mother as a little girl and my mother’s “nurse” Cleo. Cleo bathed and fed and put my mother to bed every night. Cleo listened to my mother’s prayers. Cleo held my mother’s hand every day when she walked to school, and it was Cleo who was waiting there at the school when Mom came out, to take her by the hand and walk her home after school. Of course my mother loved Cleo and of course Cleo loved my mother, but this was a little white girl and a black woman living in the South prior to the 1960s. How were they able to express their love, or even have any kind of equal relationship back then? This could only be a mutual yearning and something that it was hoped was understood, but never easily shared. It was stuff like this that was a pain of our country’s own version of apartheid that hurt both races. So to me when we think about the work done by Martin Luther King, it really doesn’t matter if in his personal life he was a hero or not (although I am going to think that those “anti-King conspiracy theorists” aren’t really right), it was what he helped to accomplish that was the important thing, the essential thing, and that is where our focus needs to be. As I drove home Tuesday night, wondering if I could die any minute, or were my remaining years to be years of suffering and effectively chained to the cardiological medical establishment (no, say, sailing around the world on an indefinite adventure like the traveling I had done so much on land), what I felt, instead, was love flowing through my heart, and I felt that no matter what this was all about, it was likely that part of God’s message to me in answer to my prayer was that I need to express love more and more; that I could be an imperfect channel (like Martin Luther King maybe was), and yet what comes through is what it is all about. That instead of me making a list of all the things that I want to do before I die, now that time is diminishing, maybe what I need to do is to think of what that ONE thing is that I need to do and forget all the rest. So far, I feel that if I have to face God and explain what my accomplishments were in this life, I don’t have too much to say. I had to think a little bit about what I even could say, and what I came up with was, “Well, everywhere I went, with everyone I met, I tried to leave a little blessing, which might have only been a bright smile that said that I honored who they were, but I always tried to treat everyone with love if I could.” Would that be enough? That I think that it is not might be a partial cause of all the stress that I have been feeling lately; like I am simply wasting time, going through the motions of life, being a nice person, sure, but not getting done what I am really supposed to do. I have often wondered if God, or my Higher Self, might simply take me out. “You’re not getting anywhere, you’re just a waste of breath.” Now it looks like the means to do so was easily there, and it was now up to me to decide whether I should relax into the route of death, or else counteract it making meaningful progress. My choice, die, or live. When I got home, I searched on the Internet for a video of Martin Luther King’s “I have a dream” speech, which I easily found, since we just recently had had Martin Luther King day and Google would therefore take me straight to it. I hadn’t known the full length of that speech, given in front of the Lincoln Memorial as the keynote of the March on Washington…we are usually given only the last part of it. It was very wonderful to watch it in its entirety, every word of it true, and when he comes to the concluding “I have a dream” part of it, this man was not reading, this man could not have previously written this and then memorized it word for word, it seems so clear to me that Martin Luther King was channeling this, being a vessel of inspiration, speaking this straight from where all true wisdom comes from. And I needed to reconnect with that kind of communication. That night before going to bed, I decided to listen to my heartbeat with a stethoscope that I have. I’m not sure if that was a good idea or not, but I guess I needed to hear it for myself, even though it was kind of scary. I’ve heard my own heartbeat many times before, and before it was always a steady and clear “bump bump…bump bump…bump bump…”, something the miracle of which I was always so appreciative of but could not grasp what it is that makes such a thing happen, that this organ can continue to beat steadily like this without let-up for ones entire life. But this time, it was more of a weak, muddy, and confused beat that I couldn’t even take my own pulse, because I couldn’t determine where it began and where it ended. There were no beginning and ending demarcations, and there was no resting inbetween. I put my hand over my heart and said to it, “Poor sweet thing, what has happened to you, and more importantly, what can we do to straighten you out or to give you what you need?” From hearing it, I was surprised that I could even be still alive, that on the outside I could get up, walk around, and feel normal. But then I realized that even a car whose timing is out of whack, with the cylinders operating a confused four-stroke pattern, can still lurch down the road. But not for very long, and not very far. I blamed only myself for this crisis. Wasn’t I the one who had been saying for so long that (certain aspects of) “this job hurts my heart”, or “this apartment is killing me”? Wasn’t I the one who realized that I was suffering in so many significant areas of my life and needed to make some major changes, but had no idea what changes to make, or how to make them, or could not find the courage to make them? For so long my mind had been a turmoil of trapped indecision and now my heart was reflecting that very turmoil by swirling my life force in a whirlpool of ineffectual turbulence. You sincerely ask God for an answer, and you will get it. Obviously this week at work was a very tough one and just about the only value of it was my interaction with other people. Also, I kept thinking that as long as I was expressing some form of love and blessing to others, I would stay alive. I don’t want to give the idea that I was being completely fearful of death. Instead, I thought more of my mother, who had suffered during the last several decades of her life, but somewhat prior to her death had revealed to my brother that she was thankful she had a heart condition, because now she had a “way out.” And, indeed, she did die peacefully in the night and despite all her very serious physical problems, it was, ultimately, her heart who had taken her out. So I felt that, like my mother, I now had my own “way out,” if I wanted it, but that it, itself, wasn’t going to be the agency making the choice. I wonder if most people don’t really fear death, itself, but just fear having a painful death? If they could just close their eyes and drift away to a better world, that might be something that they would actually like, except for the fact that in this boxing match that we call life, they may not be quite ready to throw in the towel, but want to keep on fighting for a win that they have, after all, worked all their life for. So that’s how I am viewing it. If we’re dealing with some kind of “electrical” forces that control the timing of the heartbeat, maybe stimulating certain acupuncture meridians is exactly what is called for. And a quick Internet check (I did a Google search on the key words “acupunture atrial fibrillation”) revealed that not only does acupuncture, itself, list among the maladies that it corrects heart arrhythmias, but that some western cardiologists have written articles stating that acupuncture has had success in resetting heart rhythms. Now, while it had been several years between visits to my “regular” doctor, the doctor that I HAVE seen quite often (and who really has helped me every time) is who I call “My Chinese Doctor,” because he is both Chinese, and he practices Chinese Medicine. Now there are some, of course, who would think of that as “quackery,” following the belief that ONLY in the realm of western “scientific” medicine are there any true answers, that all else is just placebo, mind games, superstition, or primitivism. But this is such an egocentric and maybe even xenophobic point of view, forgetting that a system like Chinese medicine rose up in a civilization that is far more ancient than our own and therefore its traditions have a validity on their own. Also, there is no such thing as “one condition, only one proper healing modality”; there are actually numerous healing methods that can and do work. I think it is severely limiting to follow only the “approved” medical course, especially when that “approved” medical course doesn’t offer you very much. And in my case, a lifetime of dangerous medicines that may help one organ while hurting several others doesn’t sound like the best course to follow if there are other options. So I called my Chinese doctor, explained to him what was going on, and asked him if he thought acupuncture could help. “Definitely, along with some herbs,” he said. So while I still hadn’t gotten my appointment from the cardiologist, my Chinese doctor was able to see me on Saturday. It is interesting to go to him. He works out in Alhambra, where there is a quite a large Chinese population; in fact, I think the Chinese are the majority there. English is not his first language and when he does his examinations, he takes notes in Chinese. I think he probably doesn’t have a lot of patients who aren’t Chinese. Sometimes I have to work to interpret what he saying, which comes out almost like poetry, and by that I mean that I think Chinese is a very poetic language, which I base on how their written language is constructed. For example, the word for “autumn” is composed of the words “burning” and “season”. “China” is “center” “country” (duh…ones own place is at the center of the world). “Friendship” is “hand” “reaching” “moon”. And so on. I am assuming that their spoken language follows the same kind of construction. I explained to him what I had learned about how western medicine handles atrial fibrillation, what it has to offer, and he shook his head and laughed, not derisively. “Western medicine is so drastic,” he said. Where western medicine goes to one particular malady and works to correct THAT, quite often creating an imbalance in the rest of the organism, Chinese medicine works on the basis of creating a BALANCE in the system. My doctor told me that heart problems don’t arise all by themselves. For example, in my case, the kidneys are involved and it is necessary to work on those as well as the heart. His examination consisted of his carefully taking my pulse on various sections of both wrists. His reading of the pulse on my left wrist made him say, “heart pump very weak.” His reading of the pulse on my right wrist made him say, “metabolism very slow.” Then he listened to my heart with a stethoscope, and he said “heart all floppy, starving, not pumping strong, malnourished, desperate, crying for help.” I said to him that what he said made me think of a fish that was taken out of the water and placed on the desk, “flopping around gulping for air, but in the case of my heart, it is gulping for nutrition”. He nodded, yes, that is a good explanation. I reflected back on my original question to God about why I felt ravenous all the time, and the answer had something to do with “the way to Martin Luther King’s heart was through junk food,” which could be interpreted in a sort of Chinese language way as “loving heart not getting food it needs but taking weak comfort as substitute.” Something in my weary spirit was blocking the activity of my heart and I had been taking comfort in “escape” is how I read that. Then my Chinese doctor examined my tongue and the first thing he said was “you didn’t eat breakfast?” Wow, he could see that? I told him that there is a coffee shop over in nearby San Marino that I wanted to treat myself to for breakfast, which I was going to do after my visit with him. I do NOT routinely skip breakfast…in fact, it is the one meal that I always insist that I get. I kind of hoped that he might pick up on the implications of that “treating myself to a breakfast there,” the meaning of which, underneath, was that I was not otherwise receiving a lot of love. Again, “the way to Martin Luther King’s heart” might be COMFORT FOOD (if he could get it). “Tongue very dry,” the doctor said. He then asked me to curl my tongue up so that he could look underneath it. “Very dark blue,” he said, which he considered a very bad sign and confirmed for him the kidney connection. “Too much fire,” he said. “Water is prevented from going low.” I took this to mean that fluids in my body, such as my blood (but also could be lymph and other fluids) were having trouble circulating like they would like to and should, so things were sluggish in my metabolism, and not enough nutrients, oxygen, and the like, were being carried by the bloodstream into my heart at the rate they were needed, so the heart, which, of course, needs the benefits of what the blood brings as well as the rest of the body, was, itself suffering and therefore unable to do its job properly. I gathered that this “water” problem was in the kidneys, and what the doctor wanted to do was “cool down the kidneys” as well as “clean up and purify the blood”, which would improve things all around. I asked him what would cause this problem in the kidneys, but he shrugged his shoulders and said “I don’t know, it just happens.” But rather than thinking that this was the hole in the Chinese Medicine system, I kind of chuckled and understood that yes, things DID happen. Maybe I wasn’t drinking enough water, or something (there’s never enough of doing that, it seems). 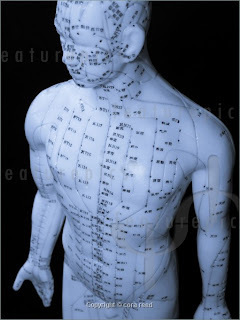 He then pulled around his “acupuncture man”, an ivory-looking statue of a man with all the acupuncture meridians drawn on it and each acupuncture point identified with a pair of Chinese characters. He showed me where he was going to stick the needles. The first place was in the center of the palm of the hand, where he said, “This is going to hurt.” Funny, for some reason, I hadn’t thought that acupuncture was actually going to hurt, otherwise I might not have thought it was such a good idea. He tried to explain to me in English the name of this and all the other points, but he just didn’t know enough English in order to do so. Well, looking at that statue covered with hundreds of points, I could well imagine that it would be impossible to translate them all into English…it would be like coming up with Chinese terms for every kind of IRS deduction or subtotal. You know words like “passive loss carryover” or “unearned income deduction” or whatever. They may not even HAVE English translations. I mean, after all, even our own medical terms aren’t really English, but various syllabic combinations of Greek, or maybe Latin. Anyway, the palm of the hand starts the heart line, and then there were two points on the wrist that control the timing of the rhythm. On the forehead near the hairline were two or three points that he described as “the spirit,” which I took as meaning the genesis of the impulses that control the heart chambers. Then there were two or three points near the ankle that work on the kidney line (interestingly, that was right in line with the idea of “water seeks the low places”). Fortunately, the only point that he said would hurt was the one in the center of the palm. He then took me into his acupuncture room and asked me to take off my shoes and socks and lie down on the table. I also took off my glasses and rolled up my sleeves. He joked about how there was almost no room on the table for me, because my feet were right up against the wall. “For Chinese people,” he said, who are shorter, so it is entirely possible that I was the very first Caucasian he had ever had in there. I joked and said, “So you don’t get many basketball players…seven feet tall.” He shook his head, no, no basketball players. Then, after swabbing the various locations with alcohol, came the needles. He was going to do this on both arms and both legs. He started with my right arm. The needles in the wrist area I could hardly feel. He asked me if they hurt and I said said “No.” Then I could feel that he was poised over my hand, and he said “This one will hurt.” And yes, it did, although the pain was quick and it was tolerable. Then he reached over the left arm and, again, the wrist needles didn’t hurt. And again, he warned me when the needle for the palm of the hand was going to come, and YOW! That one made me shout out, oh BOY did that one hurt, like an electric shock! And it kept hurting for a while, but then calmed down. He said that that was very good, the pain showed that it was the right place and that it was working. Then he went down to the ankles and warned that they would hurt, too, which they did, but differently. The kidney needles burned, but then the pain died down. He told me he would leave the needles in there for fifteen minutes, he set a timer, covered me with a warm blanket, turned off the light, and shut the door. I lay there calmly with something like twelve needles in me and did not dare move. I can’t say that it was relaxing, but it was okay; fifteen minutes would be bearable. After the timer rang, he came in and took out the needles (which didn’t really hurt, although I could feel them coming out). The area where the ankle needles had been itched a lot at first, which I told him, but he just nodded. After I got my shoes back on, he gave me a bag of the herbal pills he was prescribing for me—one bottle was herbs for the kidneys, another was called “blood clots cleaner” and the third one was called “pulse resetter”). I was surprised, but happy, to see that the functions of those latter two herbs were similar to what a cardiologist would prescribe, but safe and with no side effects. So I felt that I was getting exactly what I needed. He told me that the pills were a two-week supply, that I should come in and see him again in two weeks. I asked him what his advice would be concerning my potential upcoming cardiologist appointment, should I go to it, or should I skip it? He asked me when the appointment was going to be, but I said that I didn’t know, it was going to be mailed to me…it could be a week away, or maybe a couple of weeks away. He advised me to NOT go see the cardiologist until after I had seen HIM two weeks from now. “Then we will see,” he said. Okay, that is fine with me. I really don’t want to get all started with the cardiologist if this Chinese Medicine treatment works. I left his office feeling very good, and then went to breakfast at the Colonial Kitchen in San Marino. I ordered my “usual” for when I go there, which they call “The Titan” (so I think you imagine), and it was delicious, of course, but ended up being more food than I could possibly eat, which I took as a good sign. Ordinarily, I would have eaten the whole thing, but this time, I could only manage half of it. I hoped that meant that the acupuncture had already gotten some nutrients properly circulated around to the heart. Maybe that was wishful thinking, but there was no arguing with my sudden change in appetite. Before hitting the road again, I went to the bathroom at the restaurant and while I was sitting on the toilet, I began to wonder if it would help to periodically massage the acupuncture point in the center of the palms of my hand, working on the heart line. As I massaged the palm with my hand, I suddenly realized with a shock that that was the point of the placement of Jesus’s crucifixion nails. The realization immediately brought tears to my eyes; for one thing, this was the point that HURT the most, but also, I thought that with the power of JESUS’S heart, the pain must have been immense. Then I thought how amazing that was symbolically and it seemed to tie together the disparate elements of the physical heart, the loving heart, Jesus, and acupuncture. The Jesus connection didn’t die down, because I spied sitting on top of a pile of books at home a little volume called The Way Out, which caught my eye because its title was what my mother thought of her heart condition, “her way out,” but I knew that this book was a collection of four Christian essays. So I got comfortable and read the first one, and it really spoke to me about how my own negative self-talk could create the manifestation of this heart problem and also that the way out would be to realize that my struggles were failing to solve my problems, which led to this heart condition as a manifestation of my struggle, but that a surrender to God (and God’s guidance) would be the solution. Well, I certainly already knew and understood that, but it never hurts to be reminded of it, especially when you aren’t following it and that not following it gets you into serious trouble! I thought that first essay was enough for me to chew on and practice for a while, so I have saved the other ones to read at a later time. Meanwhile, I felt that the rest of Saturday was a good time for me to read some things that a close friend of mine had given me a couple of weekends ago when I had gone to Palm Springs for the three-day Martin Luther King holiday. I had started, but never finished, a post here about that weekend, but I will just say that this is a friend I have known since I was a freshman and he was a junior in college. I used to write to him quite a lot when we were much younger, quite notably during the summers between college years, and then after he graduated and entered into the Navy while I was at Berkeley, and then at other significant periods in our lives. He had saved all those letters, but now that he is retired, he decided to start getting rid of a lot of stuff and came across this collection of letters. He read them all once more, and then said to me that he can’t imagine why I am not a best-selling author today. Anyway, he thought that the letters were wonderful and figured I would love to have them back. Wow, yes, I sure would! So I spent the rest of yesterday reading these letters and of all the things that I could have done, I can’t think of any better care for my heart than to have read these letters! For one thing, laughter is supposed to be good medicine for the heart, and I think these letters of mine made me laugh harder than anything I have ever seen in all my life, including I Love Lucy episodes or my favorite funny movie, What’s Up Doc?, starring Barbra Streisand, Ryan O’Neal, and Madeline Kahn. 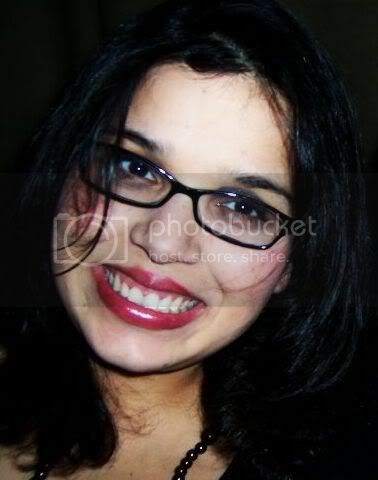 But beyond all the laughter, I don’t know any other way to say it, I simply fell absolutely and utterly in love with this person whom I was oh so long ago, who was so sweet, so precious, so smart, so talented, so beautiful, so thoughtful, and SO FUNNY! Whatever happened to him? I want him back, I want to see him, to be him, to feel him back inside me. Surely the chafing of life and the rigors of aging are not enough of an explanation for the loss of that person, and maybe that is what, or whom, my heart has been yearning for all this time—me, my true self, whom I started out to be and whom I should be once again. So please God, I surrender to you. Please let the water flow...down from you and through me. Fascinating post. My husband is starting acupuncture school next month and reading your experience makes me even more excited for him. Thanks for sharing. I was diagnosed with A-Fib when I was 19 or so. I was told its usually found in 70 year men. A lot of doctors stopped by my bed in the hospital to see this teenager with A-Fib. I was never treated for it till a few years ago. I would just go to the ER when I had an attack that didnt revert in an hour. The cardiologist kept me in his office till he had convinced me to start treatment. It was the thought of having to take this medicine for the rest of my life, and the blood tests every month or so. After 9/11 I had attacks more often so mine is directly related to stress. And after keeping me in the hospital for 9 days they couldnt find the cause.